An unusual confluence of factors make this one of the more interesting January weekends in ages. A strong set of new films, plus one of the rare times that a major Oscar contender is earning big bucks at the time of its nomination, along with a newly-minted all-time box office champ, gives us a ton of things to look at this weekend. 2014 was in no small (hee) part The Year of Kevin Hart, with four films of moderate to large success. 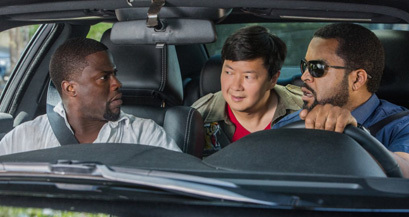 The first and most successful of these, Ride Along, gets its sequel this weekend, hoping that his pocket-Eddie Murphy status is just as strong two years later. The original saw Hart team up with hard-bitten cop Ice Cube, as a way to prove his worth in marrying his sister. Now for Ride Along 2, we dip heavily into the comedy sequel playbook, moving the setting to Miami, a boost in status for Hart, adding a second high-strung comic relief character (Ken Jeong) and bringing in the latest hot female comedy actress (Olivia Munn). This is the sort of thing that works well (Rush Hour 2) until it doesn’t (Rush Hour 3). Directed again by Tim “My Fantastic Four movies don’t look so bad now, do they” Story, it’s a film that’s basically trying to hit all the beats of the first one again, but louder and longer. Hence Jeong’s appearance as a sort of “Joe Pesci in Lethal Weapon” character, and the extended comedy bits where Hart ends up being smacked around a lot. This turn for a sequel was expertly parodied before in 22 Jump Street, but Cube decided to play it straight for his own franchise – which might explain why people are trying to figure out how to get more Jump Street movies out there, and view this one as more of an obligation. Reviews are through the floor, but it’s a fairly review-proof audience for this film, and there’s still a bit of an afterglow effect for sequels in place. With the first film’s $41 million opening, we should see a solid tick upwards to $46 million.